I think that most of us can agree that the best part of a pizza is the toppings, so why not use a chicken breast instead of a pizza base for a protein packed meal. Who doesn’t want pizza after a workout? 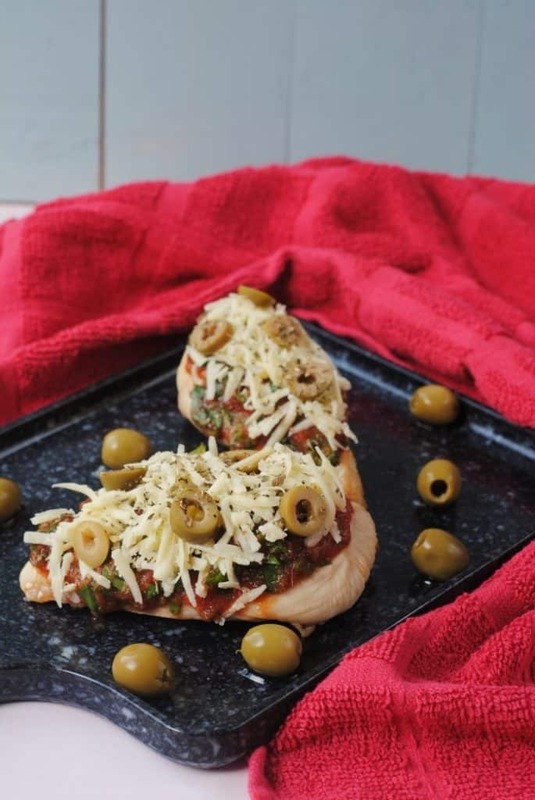 These Pizza Chicken Breasts are perfect. There is so much that you can do with chicken breasts and they make a relatively cheap and healthy addition to any meal. 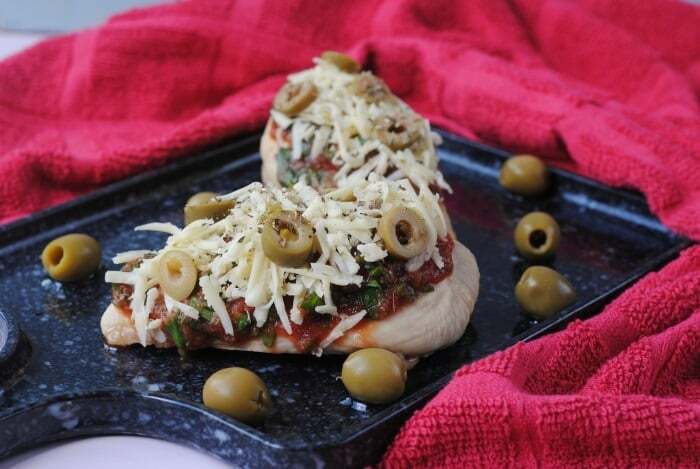 It can be easy to get in to a rut with cooking them the same way, so why not try these pizza chicken breasts. 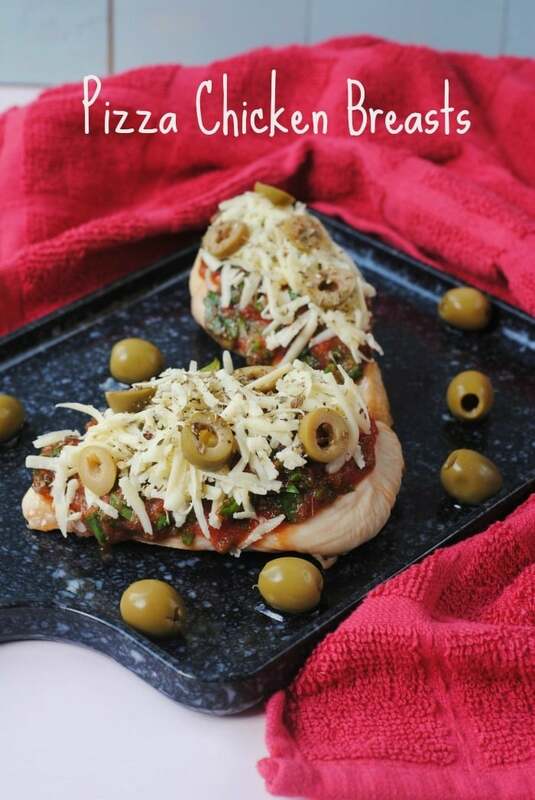 Do you want to be kept up to date on delicious and healthy recipes like these Pizza Chicken Breasts? Please subscribe to the blog mailing list (it takes 30 seconds). You will get sent the new recipes straight to your inbox. Your email address won’t be passed on to anyone and you will never be spammed. Click here to sign up. Happy September everyone!!! Whilst October is usually my favourite month, I am guessing that October is going to be pretty uncomfortable for me with baby due very early November, so I have decided that this year September will be my favourite month. We are starting to say goodbye to summer (it was nice whilst it lasted) and we can start thinking about all things apple, pumpkin, cosy and comforting. Whilst this recipe doesn’t include apple or pumpkin (oh, but I do have some treats for you lined up when it comes to those), it falls under the category of cosy and comforting. There are some staples that we always buy when we go shopping. Avocados (obviously), feta (again, that was pretty obvious), milk, berries, eggs, sweet potatoes, lettuce and chicken breasts. We use chicken breasts in so many of our meals, like salads, tacos, pasta, curries, but it can be easy to do the same thing over and over again with them. Seeing as they are such a staple, I have been coming up with new ways to use them and these pizza chicken breasts soon became a favourite. 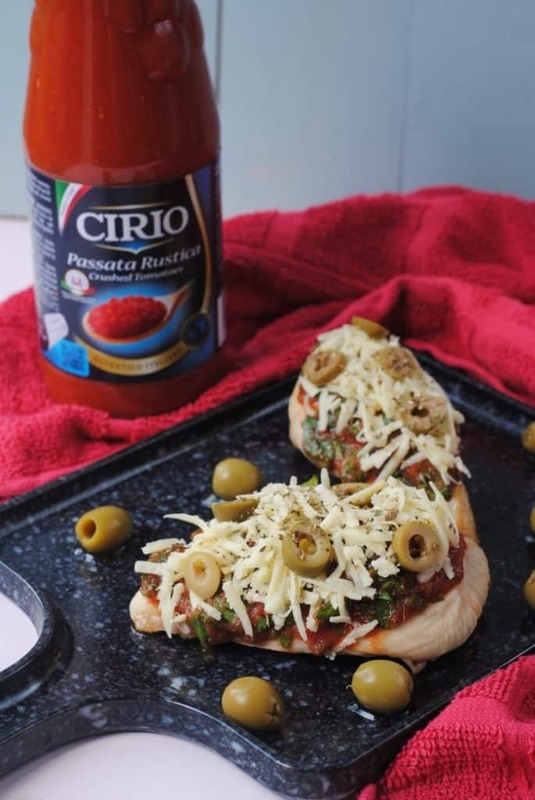 Something else we always have in the kitchen is some kind of cheese and a stack of Cirio products, so this recipe kind of made itself, as when you have cheese and tomatoes, you make something pizza related! I am a big fan of making anything in to a form of pizza, so it’s almost like this was destiny. Pizza destiny! I really don’t have any trouble getting enough carbs in to my diet, quite the opposite really, but I do struggle with protein sometimes because I don’t eat a lot of meat. I know there are TONS of veggie proteins out there, but not many that baby bump is on board with. But chicken really is packed with protein and one chicken breast really boosts my protein quota for the day. Join me in getting excited for all things autumn and ease yourself in to comfort food with these easy pizza chicken breasts. Hold on tight because the super comfort food recipes are coming! 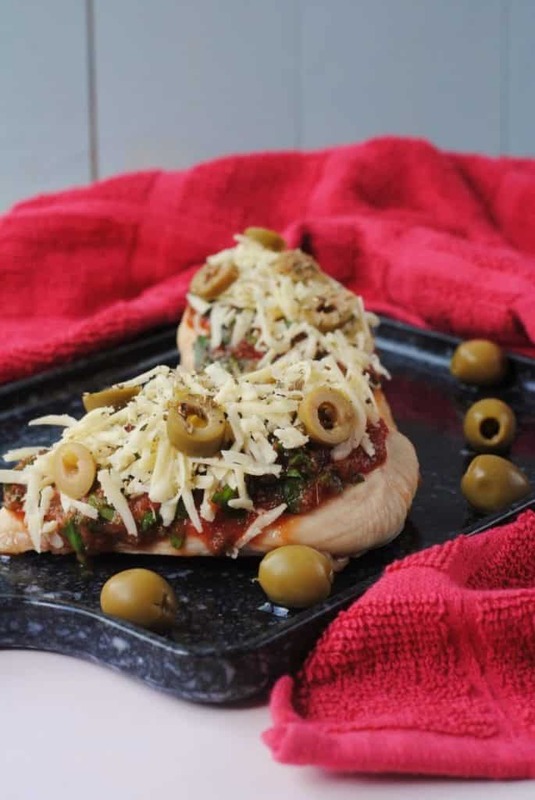 Why not use a chicken breast as a pizza base for a protein packed meal? Who doesn’t want pizza after a workout? 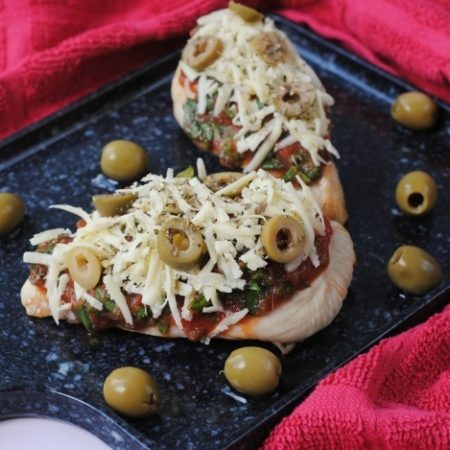 These Pizza Chicken Breasts are perfect. Put the chicken breasts in a preheated oven at 190C/400F for 30 minutes, or until cooked through. Meanwhile, in a bowl, mix together the passata, chopped spinach, garlic, oregano and salt and pepper. 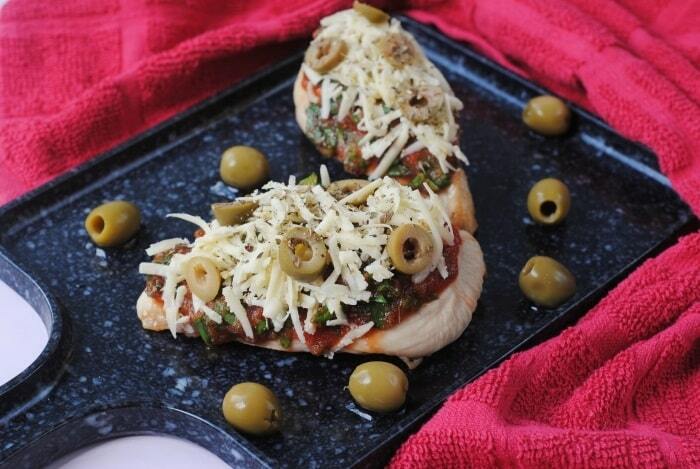 Once the chicken breasts are cooked, top with the passata mix and then sprinkle over the cheese and olives. Finally, put under the grill for around 5 minutes until the cheese is melted and crispy. I really love your creative idea xD this is full of nutrition that all of us need for a meal. my kids also love chicken breast so much, this will be a nice dinner for them. thanks for sharing this, have a nice day! Oh my gosh these are so cute!!! What a unique idea. This looks so delicious! I need to try it. Pizza is my favourite meal. I have it several times a week (yes I know that’s bad) so this is the perfect recipie for me. I will Def be trying it out! Such a fantastic idea! I never thought of making pizzas out of chicken breasts before!